For a laid back yet elegant vibe, Bahamian spirit and understated luxury, head to the stunning pink sands of Harbour Island for your honeymoon. It’s been described as a place where “one can wake up in the morning with nothing to do and only be half done by the end of the day” Harbour Island in the Bahamas offers boutique hotels, candyfloss beaches and Caribbean charm all squeezed into just 5 square miles that you navigate via golf carts. Find honeymoon heaven along the 3 miles of stunning, pale pink sand on the atlantic coast. It blushes rose during the day and a vibrant pink at sunset. For award-winning, unpretentious luxury, stay at the boutique Rock House or for your own private paradise, try The Dunmore with its elegant cottages. Make sure you bring your appetite! Harbour Island is regarded as having the best to offer in the Bahamas with fine dining at The Landing and Coral Sands worthy of a mention. It’s a paradise for water sports with calm and shallow waters perfect for snorkeling and kayaking. It’s easy to get under the skin of Harbour Island by taking a stroll of the island’s only town and the original capital of the Bahamas, Dunmore town, with its white picket fences and pastel-colored clapboard houses. A wander from Government Dock along the bay will take you past the 18th century cottages of the island’s first settlers and afford you spectacular views. 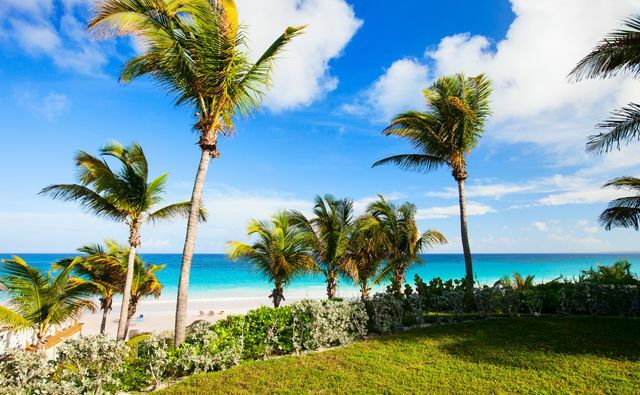 If you’re looking for seclusion and tranquility and beaches that rival those in the Caribbean and the Pacific, Harbour Island is your perfect honeymoon choice. Harbour Island is a year-round destination with warm temperatures pretty much daily. It’s also a small island with mainly boutique hotels so it rarely becomes crowded. Mid-December to mid-April is considered the peak season when hotels will have higher rates. June to September can see a little more showers and there is a slim chance of a hurricane but this is quite unusual. Mid-April to mid-December are a good time to visit to take advantage of the lower prices.